We recently drove a 2017 Hyundai Elantra Limited for a week to get a sense of how the car has changed and what it has to offer, particularly as compared to other affordable, 5-passenger compact sedans. Our test car, we’ll note up front, came fully loaded, well above and beyond what many potential buyers would expect to pay for a small Hyundai. The 2017 Hyundai Elantra SE sedan starts at $17,150, a savings of $100 when compared to the entry level MSRP of the 2016 version. This price is slightly less than class leaders such as the Honda Civic and Mazda3, although those models offer more standard equipment than the Elantra. An automatic transmission adds $1000. This model is offered with a Popular Equipment package ($800) and a Tech package ($1300). The Elantra Eco starts at $20,650. This gas-saving model model features a 7-speed dual-clutch automatic transmission and a turbocharged 4-cylinder enginethat produces 128 horsepower and boosts EPA fuel economy ratings to 32 MPG city, 40 MPG highway. 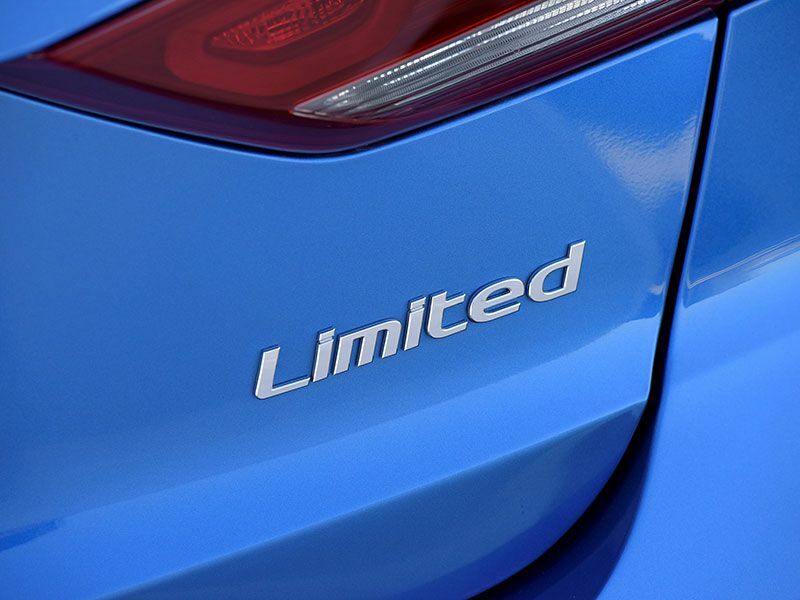 The Elantra Limited, the top-of-the-line trim, starts at $22,350. The Limited comes with plenty of standard equipment, but there are still high-end options available, namely Hyundai’s suite of active safety and driver assistance features. These come in the Limited Ultimate package for $1900, and there’s also the Tech package, full of audio and infotainment upgrades, for $2500. The 2017 Hyundai Elantra Limited comes powered by a 2.0-liter 4-cylinder engine that makes 147 horsepower. 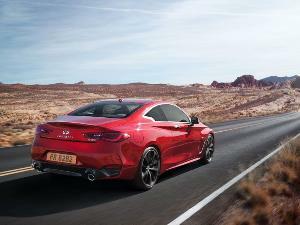 It’s paired to a smooth-shifting 6-speed automatic transmission. Together, this combination provides plenty of acceleration for takeoff and passing, and cruises easily and comfortably at highway speeds. The Elantra Limited comes with Hyundai’s Drive Mode Select system, which offers Normal, Sport, and Eco modes. For most of our test driving, Normal suited our purposes just fine. 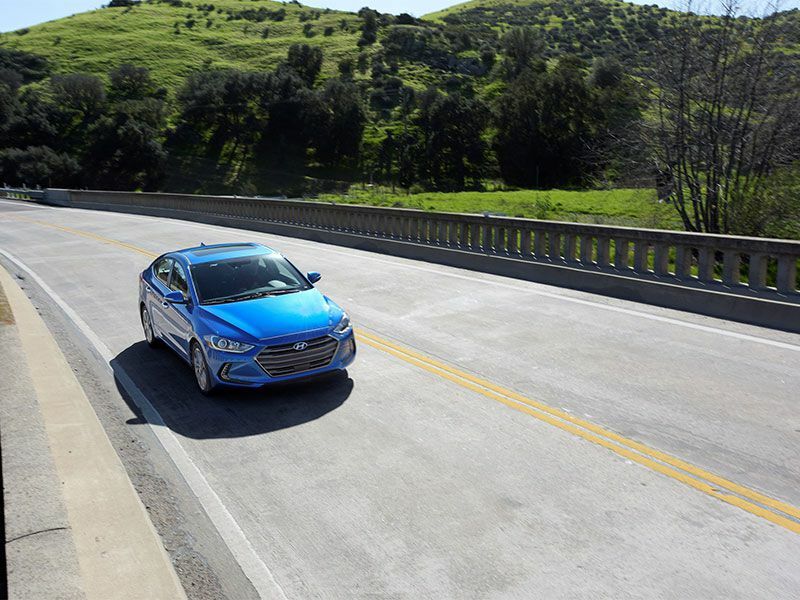 All Elantras are front-wheel drive. The 2017 Hyundai Elantra isn’t a significant styling evolution from the outgoing version—in fact, from the sides, it looks pretty much the same. 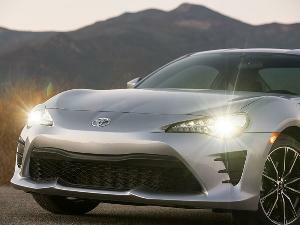 LED lighting low in the front flanks and a more aggressive grille call attention to the revised overall front end design. The Elantra Limited offers eye-catching HID headlights with Dynamic Bending Light technology, which makes the car look fresh and modern. The door handle approach lights, which cast a glow as you approach the car with the key fob, are a particularly nice touch. 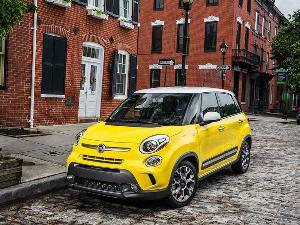 The 17-inch 2-tone alloy wheels, comprised of an angled split-spoke design, add visual interest. 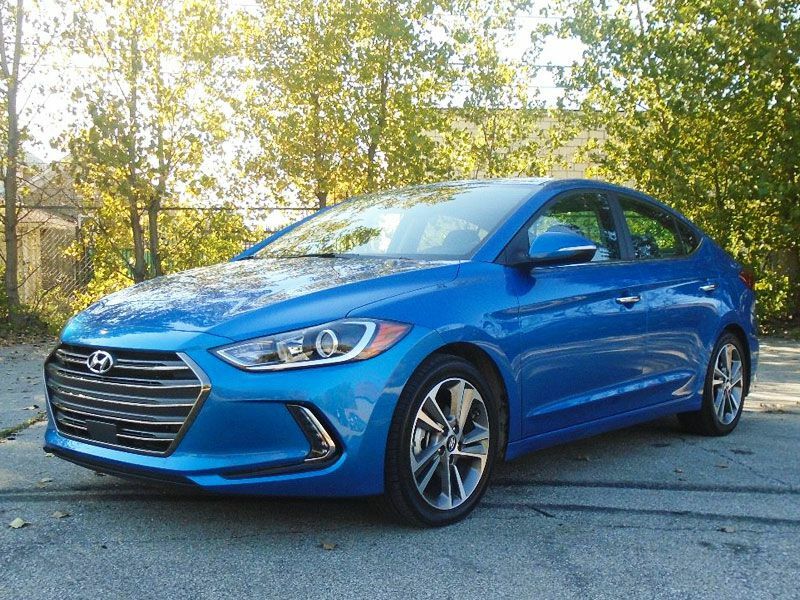 Our test car came in the Blue Titanium exterior finish, a bright and sporty option that complements the Elantra’s body lines, makes the lighting glow, and helps the car stand out in a crowd. Of course, if you’d rather blend in, there are plenty of appropriate paint hues on offer. The 2017 Hyundai Elantra Limited is surprisingly roomy inside. Although the car’s about the same size as the previous generation, Hyundai’s interior designers have made the cabin feel quite a bit more spacious this time around. 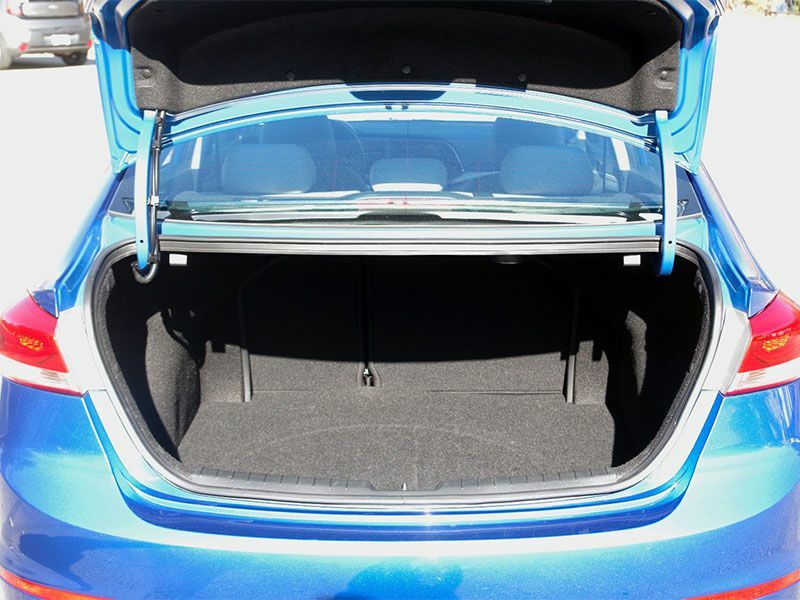 All five passengers should feel as if they’re being generously accommodated, and there are plenty of storage areas and cubbies within reach of the two front seats. It’s simple to climb in and get out of the Elantra, and easy to find a comfortable driving position, too, thanks to the power driver’s seat that's standard on the Limited. 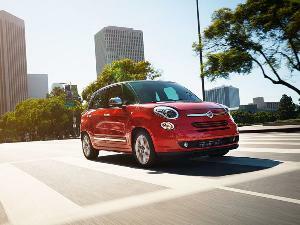 The Limited also features a memory system to save driver’s seat and side mirror positioning. Leather upholstery is standard on the Limited; our test car’s leather came in a pleasant gray hue. Heated front seats are available throughout the Elantra’s range and standard on all but the base model; our tester also had heated rear seats. For the most part, the Hyundai Elantra Limited’s infotainment system, with a 7-inch touchscreen, is easy to use. There were some annoying audio settings input by a previous test driver (making us wonder why we couldn’t hear the navigation over the music) but they were easy enough to correct once we figured out what was going on. If anything, the Elantra Limited’s audio system might offer too much customization, if the depth of menu navigation is any indication. The 2017 Elantra comes with Android Auto and Apple CarPlay, the latter of which wasn’t quite as easy to use as implied. After connecting an iPhone, we were continually prompted to activate CarPlay on the phone, even though it already was. Even after the phone appeared in the infotainment menu, the system kept prompting us to interact with and accept commands on the phone itself, defeating the purpose—eventually we just gave up. 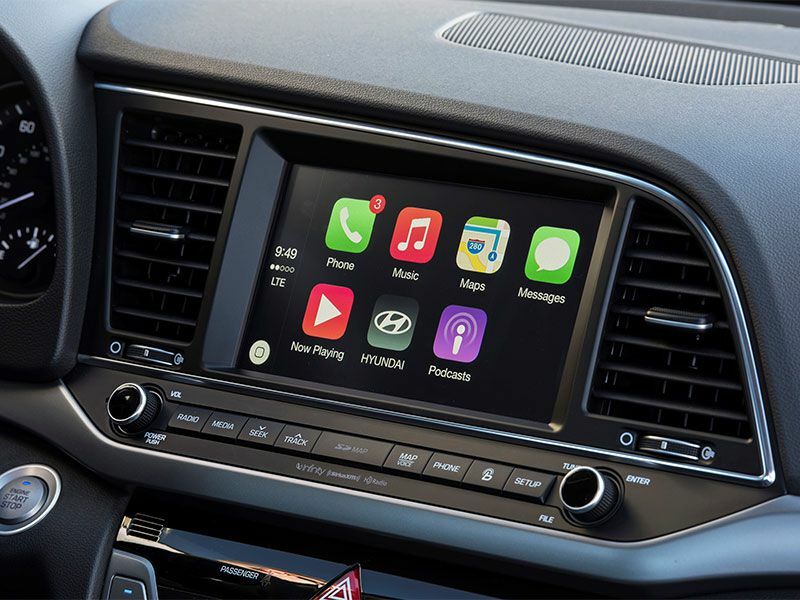 This experience is in sharp (and irritating) contrast to a recent test drive of a Hyundai Santa Fe that didn’t have Apple CarPlay, yet interacted smoothly and seamlessly with the iPhone. The redesigned Elantra comes standard with a 2.0-liter 4-cylinder engine paired to a 6-speed manual transmission; a 6-speed automatic is available. The base Elantra comes with power windows and power door locks, cloth upholstery, satellite radio, a USB port, and a 6-speaker audio system. 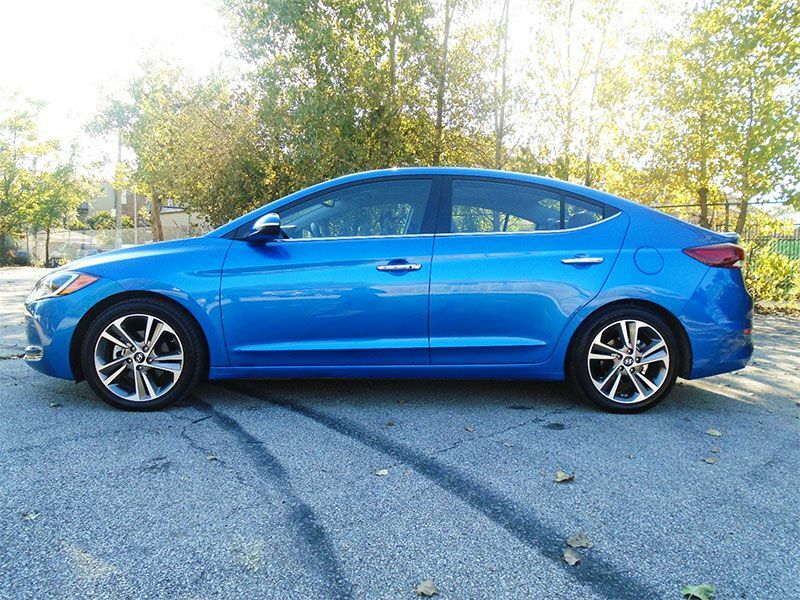 Options on the 2017 Hyundai Elantra include an upgraded audio system with a 7-inch display, or an infotainment system with navigation and an 8-inch display, as well as Bluetooth wireless connectivity, Android Auto and Apple CarPlay smartphone integration, a rearview camera, cruise control, blind-spot monitoring, dual-zone automatic climate control, keyless entry, pushbutton start, a power trunk, power front seats, leatherette or leather upholstery, heated front and rear seats, a power sunroof, and HID headlights. With the 2017 Elantra, Hyundai set out to capture the coveted Top Safety Pick+ rating from the IIHS and succeeded. This represents a big improvement over the car’s previous generation. 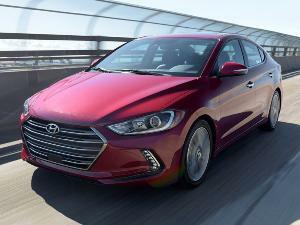 However, the Elantra fails to earn the NHTSA’s top 5-Star Overall rating. In the NHTSA ’s four tests, the Elantra earned one 5-star score and the rest are 4-star scores. The Elantra is still a safe option, but those ratings help cars, particularly small cars, stand out amongst the competition. The base Elantra doesn’t include any of its active safety or driver assistance systems (it’s worth noting here that many competitors are starting to offer rearview cameras on base models) but a $1300 tech package adds blind-spot monitoring and rear cross-traffic alert. To get the rest of Hyundai’s high-end safety offerings, you need to step up to the Limited trim level and splurge on options packages (which is precisely how our test vehicle got so expensive). It’s great that Hyundai offers this technology, but not so great that these options cost so much. Hyundai backs the 2017 Elantra with its 5-year/50,000-mile new vehicle warranty and 10-year/100,000-mile powertrain warranty. This is not particularly exciting, but it’s definitely confidence-inspiring, and should be a point in the Elantra’s favor for value-conscious shoppers. The 2017 Hyundai Elantra challenges other vehicles in its class, but the loaded Elantra Limited trim level comes in at a price point that's a little steep. If we compare the base Elantra to other vehicles in its class, at its price point, the value is absolutely there. However, at the $27,710 sticker price on our test car (which accounts for more than five grand’s worth of extras), this car might be a hard sell for those shoppers who won’t use all of the tech equipment or safety features. Many of the Elantra’s competitors recently have been redesigned, raising the bar for this already-tough segment even more. And despite our minor gripes about the redesigned 2017 Elantra, this new generation car checks most of the boxes needed to compete in this class.